Well I’d have to say the highlight of my week was the Broadway Under the Stars. On Sunday, June 28th, the Passaggio Wine Club members and the MacLaren Wine Club members met at the Jack London State Park for a fantastic evening. We gathered under the shade trees about 5pm and greeted by the Girl and Fig with a wonderful cheese platter, olives, etc. The wine was flowing from both Passaggio and MacLaren. We were then given a wonderful dinner, again hosted by the Girl and Fig. Two cheese selections served with grapes, dried fruits, spiced nuts, fig cake, fig compote, sliced baguette. Salmon nicoise, pork tenderloin, butter lettuce, haricots vert, egg, Yukon gold potatoes, caperberries, nicoise olives, cherry tomatoes, olive vinaigrette, mixed greens, roasted peaches, vanilla almonds, pear tomatoes, snap peas, champagne vinaigrette. Decadent chocolate brownies, fig & walnut crisps, chocolate chip cookies, fig kisses. Oh my!!! Then it was time. 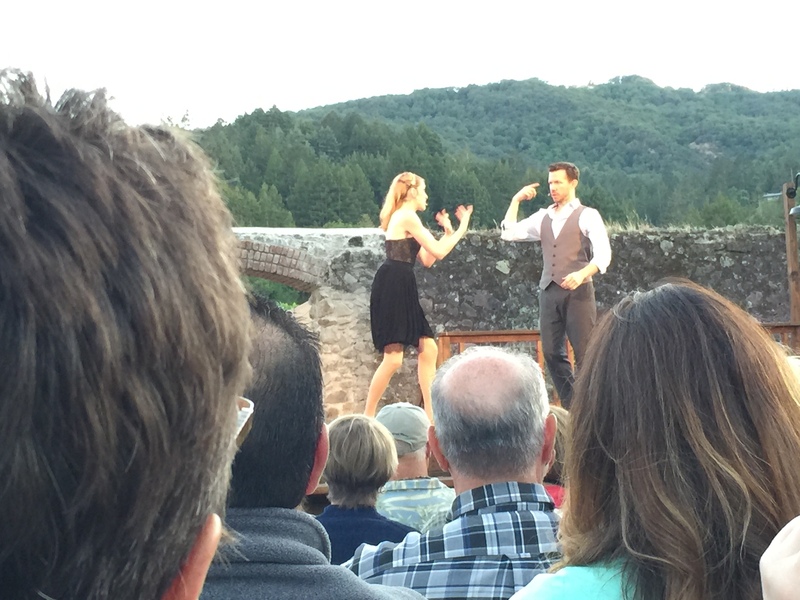 We walked to the open arena where a series of award-winning concerts, produced by Transcendence Theatre Company, features established Broadway and Hollywood performers in the majestic open-air winery ruins in Sonoma’s Jack London State Historic Park. We were in for a treat. 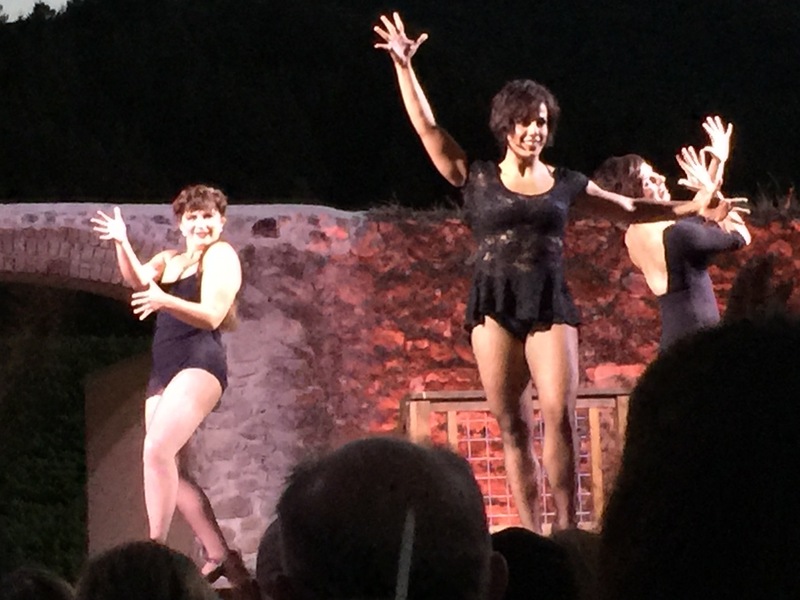 We were waiting for “Oh, What A Night!”, one of the four separate themed concerts in Transcendence Theatre’s “Broadway Under The Stars” 2015 Season. We sat down under the open sky, with the sun just about to go down. It was a beautiful evening. Everyone seemed so excited to see this musical that’s getting such great reviews! 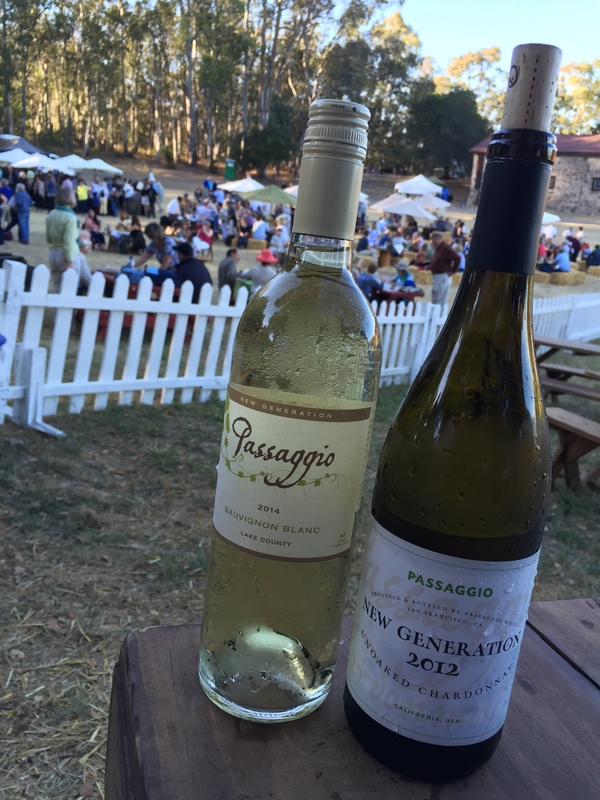 During the wonderful picnic, Passaggio poured the 2012 Unoaked Chardonnay, and the 2014 Lake County Sauvignon Blanc. The 2012 Unoaked Chardonnay displays Granny Smith apple, Meyer lemon, tropical fruit, pineapple, balanced acidity, minerality, vanilla/butterscotch, with green tea notes. The 2014 Lake County Sauv Blanc gives you big citrus, slight lantana bush, guava, pineapple, tropical fruit, floral notes, balanced acidity with a long finish. Wait, my invite must be here somewhere….